The highest household saving rate is in Sweden at 17.52% followed by Germany at 17.39% and Netherlands at 15.10%. All these values are averaged between 2015 to 2018. The lowest household saving rate is in Poland at 1.52% followed by Portugal at 4.13% and Spain at 5.84%. All these values are averaged between 2015 to 2018. For the European Union the saving rate stands at 10.24% and for the Eurozone the saving rate stands at 12.08%. All these values are averaged between 2015 to 2018. We have averaged the saving rate between 2000 to 2007 (before the financial crisis) and between 2009 to 2018 (after the financial crisis). 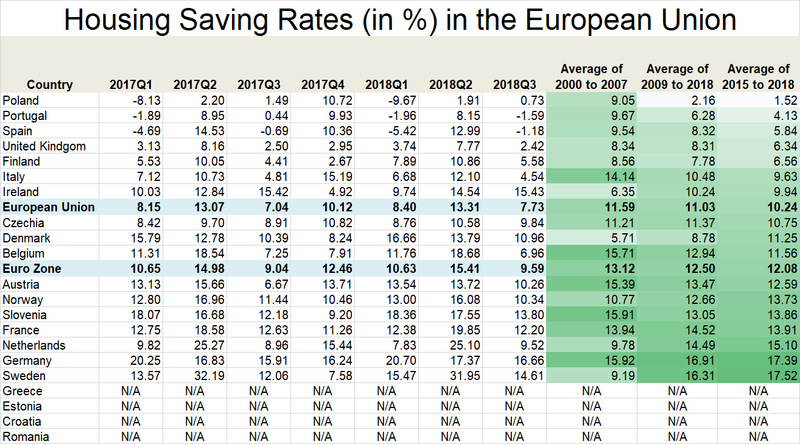 Comparing the saving rate before the financial crisis and after the financial crisis, Poland has seen the largest fall of 6.89%, Italy at 3.66% and Portugal at 3.39%. At the other end of the spectrum, Sweden has the seen the largest increase at 7.13%, Netherlands at 4.70% and Ireland at 3.88%. The Eurozone or Euro area (EA) currently includes Belgium, Germany, Estonia, Ireland, Greece, Spain, France, Italy, Cyprus, Latvia, Lithuania, Luxembourg, Malta, the Netherlands, Austria, Portugal, Slovenia, Slovakia and Finland.